Club Penguin Cheats by Mimo777 Club Penguin Cheats by Mimo777: Club Penguin Favorite Igloo Item Reviewed By You! It's so hard to choose since I like all items! But, my all time favorite would be the Box-Portal! It's totally AWESOME and I hope it'll be back on April 2012! Seriously, how cool is it to travel to another dimension!? And when minutes have look like: :30 or :00 and you're there, you get to see the orange puffle pop out of the box! It's sooo kooky and you get to meet Rookie there if you're lucky! Waddle on, Club Penguin! You rock! 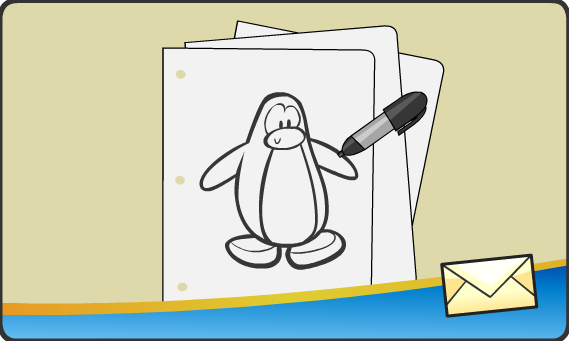 Since Billybob is planning a special Art Project soon, Club Penguin wants to know what we like to draw most for next weeks Reviewed By You? I'm partial to anything warped! How 'bout you? we should draw new igloo items!!!!!! !